The L.A. Rams have continued to build off the momentum since winning the NFC West championship through making some major money moves in this NFL free agency period. 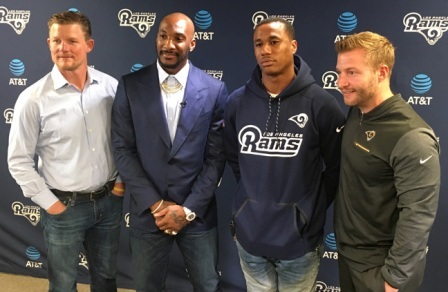 Rams general manager Les Snead and head coach Sean McVay were joined by newly acquired cornerback tandem Aqib Talib and Marcus Peters at the Rams practice facility in Thousand Oaks, CA on Wednesday (Mar. 14). “It's rare to be able to acquire two players of this caliber," said coach McVay. "So when the opportunity does present itself, you want to be ready." With limited cap space, the Rams strategy for this free agency was to find premiere talent through trades. Talib, a Super Bowl champion and five-time Pro Bowler , has the most picks by a cornerback (34) since entering the league in 2008. The 32-year-old veteran was reportedly only willing to sign with the Rams or the Patriots. “I’m in the latter half of my career, so I just wanted to be comfortable wherever I went and I’m definitely comfortable here in LA,” Talib stated. The Rams backfield will be stacked with him alongside 25-year-old Oakland native Marcus Peters, who was acquired in a trade with the Kansas City Chiefs. Peters has a reputation for on-the-field antics that he addressed during the press conference. Peters’ talent has overshadowed some of the extracurricular activity the fourth year cornerback has been associated with on the field. Since being drafted in 2015, he leads the NFL with 19 interceptions. Peters spent the past three seasons with the Kansas City Chiefs after being drafted in the first round. “Now I get to be back at home, my family gets to come see me it just feels good to be back in California,” said Peters. Both players have an abundance of personality and clear passion for the game with some similarities in their style of play. “It’s pretty rare that you have two corners who Aqib was probably once Marcus and now he’s become Aqib and then you have Marcus that he can have a mentor that he already knows, he respects and can pass wisdom along,” Snead said. The two premiere cornerbacks will fit seamlessly into Rams’ defensive coordinator Wade Phillips’ scheme. It is one that Talib is already quite familiar with from the year they won a Super Bowl in Denver. Each player commented on how last season it was easy to see how much fun the Rams team was having from the outside looking in and that they are looking forward to bringing that same energy into the locker room. The Rams defense will still feature marquee players like defensive tackle Aaron Donald, who was named the NFL’s defensive player of the year along with safety Lamarcus Joyner who was franchise tagged for the year. The Rams also elected to resign cornerback Nickell Robey-Coleman. The Rams signed free agent cornerback Sam Shields, who spent seven seasons with the Green Bay Packers before he took a year off after sustaining several concussions. Shields decided to make a return to the NFL and sign in L.A. The team will now look ahead to the NFL Draft. “L.A. just be ready we’re about to do some big things,” Peters added.